Choose the ride—big low swing, high and fast, or no swing at all. 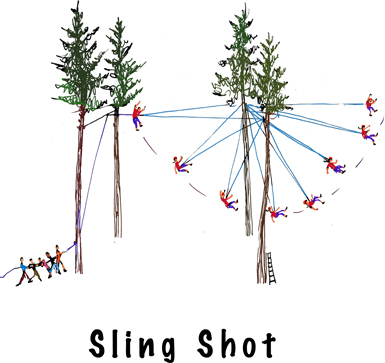 Pulled by your trustworthy group, you fly high above them into a canopy of hemlocks. In this element, one person at a time is pulled to the height that they choose for their personal challenge. Because no climbing is involved, this is a great activity for groups with people who cannot participate in other high ropes activities.